2.0 has already become India's highest-opening movie of 2018 in the international markets. It has already overtaken Padmaavat's opening weekend collection. Rajinikanth's latest offering that is also Akshay Kumar's first Tamil movie has been making headlines way before its release. News of the film's VFX was making the rounds before 2.0 hit the theatres. Once it hit the theatres, 2.0's VFX was making news again because there's nothing much in Indian cinema to compare it with. Positive word-of-mouth and Rajinikanth's fan following meant that the movie would do well in the South. However, 2.0's collection in the Northern states has been quite a surprise. As per latest reports, 2.0's Hindi version is competing with some of the biggest Bollywood releases of the year. 2.0's Hindi version has already collected Rs 111 crore in India. Rajinikanth-Akshay Kumar's 2.0 made Rs 20.25 crore on Thursday, Rs 18 crore on Friday, Rs 25 crore on Saturday, Rs 34 crore on Sunday and Rs 13.75 crore on Monday. On Monday, the producers revealed that 2.0 had already made Rs 400 crore worldwide. The movie is giving some tough competition to Fantastic Beasts: The Crimes of Grindelwald, which is rather telling since it is part of the Harry Potter franchise. According to trade analyst Ramesh Bala, 2.0 has already become India's highest-opening movie of 2018 in the international markets. It has already overtaken Padmaavat's opening weekend collection. #2Point0 is 2018's Highest Opener in Overseas (1st Weekend) for an Indian Movie..
With $15 Million 1st Weekend Gross, it betters #Padmaavat 's $12 Million..
Till Sunday, 2.0 had made Rs 24 crore in USA alone. In Australia too, 2.0 crossed the Australian $1 million mark, becoming the first Tamil movie to do so. Having said that, 2.0 needs to withstand the test of the weekdays. Sara Ali Khan's debut Kedarnath with Sushant Singh Rajput is scheduled to release in the coming weekend. Considering the amount of interest in Khan, Kedarnath is likely to give some tough competition to 2.0. Shankar's sequel to Enthiran, 2.0, takes place in the city of Chennai where cell phones are flying off people's hands and shelves. No one is quite sure how to locate them or where they are heading. Even the revered Dr Vaseegaran is confounded. Gradually things take a turn for the worse with people associated with cell phone business dying rather mysteriously and a monstrous, predatory bird attacking cell phone users. 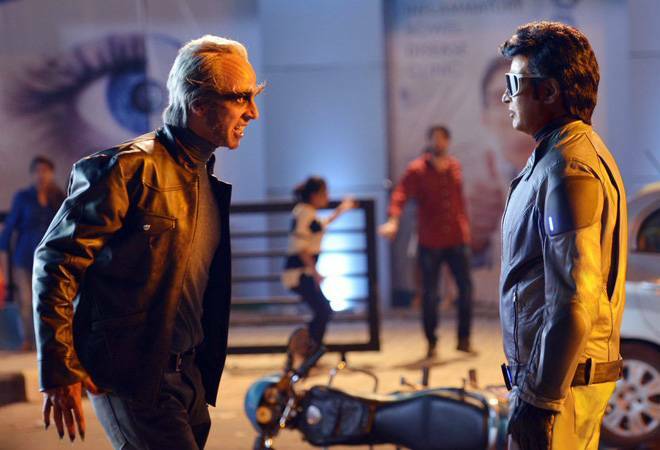 As such, only one thing can save them all - Chitti, making it imperative for the scientist to bring him back to life. The movie also stars Amy Jackson, Adil Hussain, Sushanshu Pandey along with Rajinikanth and Akshay Kumar.